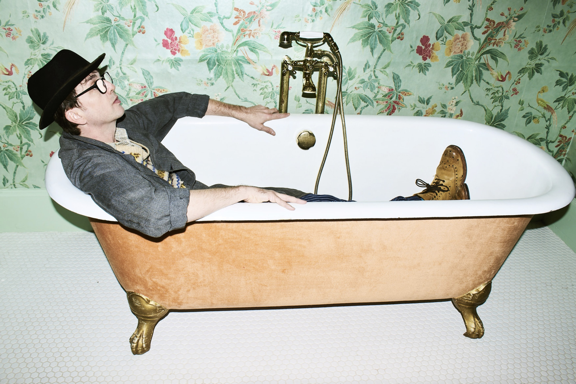 Danny Goffey was one third of Supergrass, 33% of one of the Britpop era's finest ensembles. Embarking on a number of solo projects, the UK musician is set to have a busy summer. For one, he's hosting his own festival, an alternative to Glastonbury. For another, he's working on a new album. Said LP is titled 'Schtick!' and it was released mere hours ago, a pensive piece of pop-etched indie songwriting that sits in an acerbic, deeply English vein. White Mane. It’s a forty seven minute short French film shot in 1953 telling a fable about a young boy taming a wild horse. It won the Palme d’or at Cannes film festival. I love the cinematography and the impossible ways that it captured the action using the very basic equipment of the time. I used to watch it a lot with my son Alfie and our guitarist Marley Mackey when he was a small boy. Out of the two albums I have recorded since Supergrass disbanded, I would have to choose the second one ‘Schtick!’ as my favourite. Although I know it is still a ‘new’ album and maybe I haven’t had time to lose interest in it yet, it really strikes me as an extremely competent album with a spiky fresh take on a new wave attitude. From start to finish the songs just ask to be listened to and my character really shines bright at the forefront. I like the way I regale stories of love, despair and stupidity and I’ve grown to like it very much over the past few days. My previous album ‘Take Your Jacket Off And Get Into It’ is still considered to me as a modern masterpiece but I think ‘Schtick!’ takes the biscuit. This is very hard, but out of all the fantastic books in the Mr Men series I would have to pick Mr Daydream. It is almost impossible to pick just one, as Roger Hargreaves was a true genius in the way he managed to create such wonderfully varied characters. The Flumps was a great television programme produced by David Yates for the BBC running between 1977 and 1988. The plot loosely revolved around the various adventures of a family of furry creatures from northern England. The show was written and created by Julie Holder and had a brilliantly memorable theme tune featuring George Chisholm on the trombone. As a young suburban Southerner, I found their nasal Northern accents so entertaining and evocative that they made me think of my grandfather (who was a Yorkshireman). The Helping Hand. It is a strange masturbation device that I came across in Hamburg in the mid 90s. It is in the shape of a hand and a forearm. It is an electronic device which moves up and down and is made out of a pliable rubber material which is quite realistic. I bought it and then took it home on the aeroplane with me in my hand luggage as a present for someone. Unfortunately, when the Heathrow security stopped me and searched my bags it took a great deal of explaining and convincing to make them realise that it was just a harmless gadget.